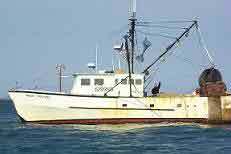 The Maine-New Hampshire Inshore Trawl Survey is a resource assessment survey performed along the coastal waters of Maine and New Hampshire. Bi-annual surveys, spring and fall, have been conducted since the fall of 2000. This survey is a collaborative research project using a commercial fishing vessel as the platform. The boat owner, captain, and crew have been actively involved in the design and implementation of this survey. Funding since 2000 has been provided through grants from the Northeast Consortium and the National Marine Fisheries Service.